* ¥ First Lieutenant Garlington, Ernest Albert: Absent sick at General Hospital Pine Ridge Agency, South Dakota, for “gunshot wound right arm” received during engagement with Big Foot Band hostile Indians at Wounded Knee Post Office, South Dakota, Dec. 29, 90. Commanding troop from Nov. 3 to 30, 90. On duty with troop from Dec. 1 to 29, 90. Second Lieutenant Harman, John A.: At Virginia A&M College, Blacksburgh, Virginia, as professor of Military science and tactics since Sept. 18, 90. Sergeant White, Andrew: Enlisted on Jul. 22, 87 at New York, New York, by Capt. Jackson. To forfeit $15.00 per month for the period of 3 months per sentence of General Court Martial, Aug. 25, 90. $15.00 accounted on pay rolls for Oct. $15.00 accounted on pay rolls for Nov. 90. Sergeant McElderry, Harry: Enlisted on Oct. 29, 86 at Fort Susiton, Dakota Territory, by Lieut. Ritzins. Transfer as Sergt. from Troop M to A, 7th Cavalry Dec. 1, 90. Joined troop Dec. 1, 90. Corporal Gillen, George: Enlisted on Jun. 9, 90 at New York, New York, by Capt. Wagner. Corporal Sutherland, George: Enlisted on Jun. 10, 90 at Fort Riley, Kansas, by Lt. McCormick. Corporal Courville, Louis: Enlisted on Jul. 31, 88 at Boston, Massachusetts, by Capt. Miller. Sick “strain and contusion left knee and right side” contracted in line of duty, in quarters from Nov. 6 to 22, 90. Corporal O’Doole, Michael: Enlisted on Jul. 1, 89 at Boston, Massachusetts, by Capt. Miller. Appointed Corporal from Private to date Nov. 1, 90. Trumpeter Ehrhardt, George: Enlisted on Jun. 11, 89 at New York, New York, by Capt. Wagner. Trumpeter Grill, Charles: Enlisted on Feb. 14, 90 at Pittsburgh, Pennsylvania, by Capt. Heiner. Sick “follicular tonsillitis” contracted in line of duty, in quarters from Dec. 17 to 21, 90. Farrier Latimore, Christopher B.: Enlisted on Jan. 7, 87 at Cincinnati, Ohio, by Lieut. Hunter. Blacksmith Goodwin, William J.: Enlisted on Jan. 7, 86 at Fort Meade, Dakota Territory by Lieut. Wilkinson. Wagoner Abrumson, Hermon: Enlisted on Apr. 4, 89 at Cincinnati, Ohio, by Capt. Ropes. Private Beauman, Alfred: Enlisted on Oct. 1, 87 at Camden, New Jersey, by Lieut. Heyl. On special duty from Dec. 16 to 26, 90. Orderly for Brig. Gen. Brook, U.S.A. per authority of Regimental Commander. Sick “orchitis left testicle, traumatic and chronic” contracted in line of duty, in Hospital from Nov. 16 to 22, 90. Private Burbank, Charles R.: Enlisted on Feb. 1, 87 at Fort Snelling, Minnesota, by Lieut. Andrews. Private Bailey, William T.: Enlisted on Sep. 16, 89 at Baltimore, Maryland, by Capt. Huggins. On special duty Post Gardner from Nov. 9, 90, Fort Riley, Kansas, relieved from aforesaid duty per verbal orders Post Commander Fort Riley, Kansas Nov. 23, 90. On special duty as Hospital Corpsman since Nov. 24, 90, per authority Regimental Commander. Private Bothwell, James: Enlisted on Aug. 23, 90 at Detroit, Michigan, by Lieut. Lockett. Due U.S. Laundry Jefferson Barracks, Missouri. 35¢. Recruit from depot, Assigned to troop to date Nov. 28, 90. Joined troop Dec. 6, 90. Sick “acute diarrhea” contracted in line of duty, in quarters from Dec. 18 to 21, 90. Private Cormack, George: Enlisted on May 19, 87 at Jefferson Barracks, Missouri, by Lieut. Fountain. To forfeit $5.00 of his pay per sentence of Summary Court, Fort Riley, Kan. Nov. 17, 90, deducted on pay rolls for Nov. 90. Private Chortrand, George: Enlisted on Sep. 21, 87 at Saint Louis, Missouri, by Capt. Smith. Private Cavanagh, Michael: Enlisted on May 29, 90 at Boston, Massachusetts, by Capt. Kandall. To forfeit $2.50 of his pay per sentence Summary Court, Fort Riley, Kan. Nov 12, 90. Private Carter, Cassuis R.: Enlisted on Jul. 1, 90 at Saint Louis, Missouri, by Capt. Kauffman. Due U.S. $1.35 commutation of rations furnished which en route from Fort Reno, D. T. to Ft. Riley, Kan. Due U.S. $10.13 for transportation furnished from Ft. Reno, D. T. to Junction City, Kan. Transferred from Troop G 5th Cavalry to 7th Cavalry and assigned to Troop A to date Nov. 28, 90. Private Dean, Thomas: Enlisted on Feb. 24, 87 at Fort Keogh, Montana Territory, by Lieut. Bailey. * Private Duncan, Harry L.: Enlisted on Dec. 27, 88 at Fort Riley, Kansas, by Lieut. McCormick. Sick “contusion of back, slight” contracted in line of duty in quarters from Nov. 6 to 9, 90. Sick “acute tonsillitis” contracted in line of duty, in quarters from Dec. 23 to 26, 90. Absent sick at General Hospital, Pine Ridge Agency, S. D. since Dec. 29, 90, “Pistol wound of face” received during engagement with Big Foot Band, hostile Sioux Indians, at Wounded Knee Post Office, S. D. Dec. 29, 90. Private Franklin, Charles: Enlisted on Jan. 27, 87 at Detroit, Michigan, by Capt. Loua. On Extra duty as laborer Quartermaster Department from Oct. 24, 90. Relieved from aforesaid duty per verbal orders Post Commander Ft. Riley, Kan. Nov. 23, 90. Sick “incised wound left index finger” contracted in line of duty in quarters from Dec 9 to 14, 90. Private Flynn, Andrew M.: Enlisted on Jul. 30, 88 at New York, New York by Lieut. Wheeler. Private Fox, Michael J.: Enlisted on Jan. 17, 89 at Newark, New Jersey, by Lieut. Carter. Private Faulknor, Frank D.: Enlisted on Jul. 20, 88 at Cincinnati, Ohio, by Lieut. Hunter. Sick “muscular rheumatism and Acute bronchial catanh” contracted in line of duty in quarters from Dec. 13 to 26, 90. Private Hammond, William P.: Enlisted on Jan. 1, 87 at Ft. Keogh, Montana Territory, by Lieut. Bailey. On detached service at Ft. Riley, Kan. since Nov. 24, 90; troop in the field no Mount. ¥ Private Hobday, George: Enlisted on Oct. 5, 86 at Chicago, Illinois, by Capt. Quinton. On special duty Post Canteen from Nov. 8, 90, relieved from aforesaid duty per verbal orders Post Commander Ft. Riley, Kan. Nov. 13, 90. Adjutant General Office granted a Medal of Honor, Order 4677 – P.R.D. 1891. Private Hamilton, William: Enlisted on Aug. 19, 88 at Cincinnati, Ohio, by Lieut. Hunter. On special duty as troop baker since Dec. 1, 90, per authority of Regimental Commander. Private Huff, John C: Enlisted on Nov. 19, 88 at Cincinnati, Ohio, by Capt. Neulau. On extra duty as Mechanic Quartermaster Department from Oct. 14, 90, relieved from aforesaid duty Nov. 16, 90. On detached service since Nov. 14, 90; troop in the field, no mount. Private Hoff, Charles: Enlisted on May 15, 89 at Saint Louis, Missouri by Capt. Morgan. To forfeit $2.50 of his pay per sentence of Summary Court, Camp at Pine Ridge Agency, S. D. Nov. 17, 90. Private Hutchinson, Orlando W.: Enlisted on May 21, 90 at Belleville, Kansas, by Lieut. Donaldson. Due U.S. for clothing overdrawn at date of settlement, Nov. 20, 90, $10.23, deducted on pay rolls for Nov. 90. Private Harrington, James: Enlisted on Jun. 9, 88 at Fort Sheridan, Illinois, by Lieut. Turner. To forfeit $3.00 of his pay per sentence of Summary Court, Fort Riley, Kan., Nov. 13, 90, deducted on pay rolls for Nov. 90. Sick “sprain right ankle” contracted in the line of duty, in quarters from Dec. 13 to 15, 90. Private Hall, William: Enlisted on Aug. 19, 90 at Chicago, Illinois, by Capt. Nowlan. Due U.S. Laundry Jefferson Barracks, Mo. 17¢. Recruit from depot, assigned to troop to date Nov. 28, 90; joined troop Dec 6, 90. Private Knoblauch, William: Enlisted on Aug. 9, 88 at Camden, New Jersey, by Lieut. Heyl. On detached service with Band 7th Cavalry at Fort Riley, Kan., since July 9, 90. Private Launchbaugh, Reuben A.: Enlisted on May 12, 90 at Mankato, Kansas, by Lt. Donaldson Due U.S. for clothing overdrawn at date of settlement, Nov. 11, 90, $9.68 deducted on pay rolls for Nov. 90. Private More, Harmen: Enlisted on Nov. 30, 86 at Baltimore, Maryland, by Capt. Overton. On special duty as Assistant Troop Cook since Nov. 24, 90 per authority of the Regimental Commander. * Private McMahon, Daniel: Enlisted on Sep. 27, 87 at Philadelphia, Pennsylvania, by Lieut. Scott. To forfeit $2.00 of his pay for sentence of Summary Court, Fort Riley, Kan. Nov. 17, 90, deducted on pay rolls for Nov. 90; sick “contusion right index finger” contracted in line of duty, in quarters from Oct. 25 to Nov. 5, 90; absent sick at General Hospital, Pine Ridge Agency, S. D. since Dec. 29, 90, “gunshot wound right foot” incurred during engagement with Big Foot Band, hostile Sioux Indians, at Wounded Knee Post Office, S. D. Dec. 29, 90. Private May, George W.: Enlisted on Aug. 16, 88 at Cleveland, Ohio, by Capt. Kellogg. Private Meier, John H.: Enlisted on Sep. 17, 88 at Fort Riley, Kansas, by Lieut. McCormick. * ¥ Private Neder, Adam: Enlisted on Jun. 22, 86 at Saint Louis, Missouri, by Lieut. Craig. Absent sick at General Hospital, Pine Ridge Agency, S. D., since Dec. 29, 90, “gunshot wound right shoulder” received during engagement with Big Foot Band hostile Sioux Indians at Wounded Knee Post Office, S. D., Dec. 29, 90. Private Nuvell, Eugene C.: Enlisted on May 7, 90 at Beloit, Kansas, by Lieut. Donaldson. Due U.S. for clothing overdrawn at date of settlement, Nov. 6, 90, $10.80 deducted on pay rolls for Nov. 90. Private O’Donnell, Frank H.: Enlisted on Feb. 18, 87 at Philadelphia, Pennsylvania, by Lieut. Scott. To forfeit $3.00 of his pay per sentence of Summary Court, Fort Riley, Kan., Nov. 18, 90, deducted on pay rolls for Nov. 90. Private Orlopp, Eduard: Enlisted on Oct. 19, 88 at Jefferson Barracks, Missouri, by Lieut. Sands. To forfeit $3.00 of his pay per sentence of Summary Court, Fort Riley, Kan., Nov. 14, 90, deducted on pay rolls for Nov. 90; to forfeit $5.00 of his pay for sentence of Summary Court, Fort Riley, Kan., Nov. 20, 90, deducted on pay rolls for Nov. 90. Private Ouelette, Ferdinand: Enlisted on Sep. 15, 90 at Saint Louis, Missouri, by Capt. Kauffman. Recruit from Depot Assigned to troop to date Nov. 28, 90; absent sick at Fort Robinson, Neb., from Dec. 2 to 16, 90, disease, not known, since Nov. 28, 90 (gonorrhea, not contracted in line of duty); taken sick and left at Fort Robinson while en route to join regiment. Private Pingree, David H.: Enlisted on Aug. 18, 90 at Newark, New Jersey, by Capt. Cooper. Due U.S. Laundry Jefferson Barracks, Mo., 30¢; due U.S. for Subsistence Stores 96¢; recruit from Depot; assigned to troop to date Nov. 28, 90; joined troop Dec. 6, 90. Private Robertson, William: Enlisted on Jan. 15, 89 at Boston, Massachusetts, by Capt. Miller. Private Richards, Louis W.: Enlisted on Sep. 9, 90 at Hartford, Connecticut, by Capt. Montgomery. Due U.S. Laundry Jefferson Barracks, Mo., 55¢; recruit from Depot; assigned to troop to date Nov. 28, 90; joined troop Dec. 6, 90. Private Symmes, James G.: Enlisted on Jun. 11, 88 at Cincinnati, Ohio, by Lieut. Hunter. Sick “catanhal conjunctivitis both eyes” contracted in line of duty, in quarters from Dec. 3 to 10, 90. Private Stynn, Harry: Enlisted on Apr. 3, 89 at Boston, Massachusetts, by Capt. Miller. Sick “accute coryza” contracted in line of duty, in quarters Nov. 16, 90. Private Slaughter, William J.: Enlisted on May 28, 90 at Detroit, Michigan, by Lieut. Lockett. Due U.S. for clothing overdrawn at date of settlement, Nov. 27, 90; $4.79 deducted on pay rolls for Nov. 90. Private Schutt, Fredrick H.: Enlisted on Jan. 8, 89 at New York, New York, by Capt. Wagner. On extra duty as Mechanic Quartermaster Department from Sep. 8, 90, Fort Riley, Kan., relieved from aforesaid duty per verbal order Post Commander Fort. Riley, Kan., Nov. 23, 90. Private Stephenson, James W.: Enlisted on Oct. 6, 90 at Fort Riley, Kansas, by Lieut. Dyer. James Sick “vaccine” contracted in line of duty, in quarters from Nov. 1 to 6, 90. Private Snow, George D.: Enlisted on Sep. 6, 90 at Hartford, Connecticut, by Capt. Montgomery. Due U.S. Laundry Jefferson Barracks, Mo., 25¢; recruit from Depot; assigned to troop to date Nov. 28, 90; joined troop Dec. 6, 90. Private Tregilgus, Walter E.: Enlisted on Dec. 18, 86 at Fort Snelling, Minnesota, by Lieut. Andrews. Sick “constitutional syphilis” not contracted in line of duty, in hospital from Oct. 25 to Nov. 17, 90. Private Wylie, George W.: Enlisted on Oct. 1, 89 at Fort Riley, Kansas, by Capt. Grugan. Entitled to re-enlisted pay. Private Walker, George: Enlisted on Jun. 17, 90 at New York, New York, by Capt. Montgomery. Due U.S. Laundry Jefferson Barracks, Mo., 37¢; recruit from Depot; assigned to troop to date Nov. 28, 90; joined troop Dec. 6, 90. Sergeant Woodhull, Smith D.: Enlisted on Sep. 2, 87 at Philadelphia, Pennsylvania, by Lieut. Scott. On furlough from Sept. 16, to Dec. 1, 90; discharged at Pine Ridge Agency, S. D. Dec. 1, 90; discharged and Final Statements forwarded to soldier by registered mail to Pueblo, Colo.; Character “Excellent.” Due soldier for clothing not drawn in kind at date of discharge $46.09. Private Enright, Patrick J.: Enlisted on Sep. 7, 87 at Chicago, Illinois, by Capt. Hennisee. On furlough from Sept. 16, to Dec. 6, 90; discharged at Pine Ridge Agency, S. D. Dec. 6, 90; discharge and Final Statement forwarded to soldier by registered mail to Ottawa, Ill. Character “Excellent.” Due soldier for clothing not drawn in kind at date of discharge $18.62. Private Smith, Edward: Enlisted on Jun. 21, 90 at Boston, Massachusetts, by Capt. Kendall. Due U.S. Laundry Jefferson Barracks, Missouri, $1.12; recruit from Depot; assigned to troop to date Nov. 28, 90; joined troop Dec. 6, 90; sick “muscular strain” contracted in line of duty in quarters from Dec. 11 to 13, 90; transferred from Troop A to B, 7th Cavalry Dec. 13, 90; clothing account never settled; total money value of clothing drawn since enlistment $80.15 noted on description list. § Sergeant Dyer, Arthur C.: Enlisted on Jun. 20, 87 at Ft. Keogh, M. T. by Lieut. Long To forfeit $15.00 of his pay for Sent. Summary Court approved by Post Comd’r Oct. 29, 90, deducted on pay rolls for Nov. 90. Killed by “Gunshot wound of chest penetrating” during engagement with Big Foot Band, hostile Sioux Indians, at Wounded Knee Post Office, S. D. Dec. 29, 90. Due Soldier for clothing not drawn in kind at date of death $15.99. Inventory of effects etc. have not yet been performed. § Saddler Frey, Henry: Enlisted on Jun. 16, 90 at Detroit, Michigan, by Lieut. Lockett. Killed by “gunshot wound of head” during engagement with Big Foot Band, hostile Sioux Indians, at Wounded Knee Post Office, S. D., Dec. 29, 90; due U.S. for clothing overdrawn at date of death $1.80; inventory of effects etc. have not yet been performed. § Private Johnson, George P.: Enlisted on Aug. 6, 87 at Chicago, Illinois, by Capt. Hennisee. On extra duty as laborer Subsistence Department from Nov. 4, 90, Ft. Riley, Kan., relieved from aforesaid duty per verbal orders Post Commander Ft. Riley, Kan., Nov. 23, 90; killed by “gunshot wound of head” during engagement with Big Foot Band, hostile Sioux Indians at Wounded Knee Post Office, S. D. Dec. 29, 90; inventory of effects etc. have not yet been performed; due soldier for clothing not drawn in kind at date of death $11.76. § Private Logan, James: Enlisted on Aug. 21, 88 at Newark, New Jersey, by Lieut. Ivis. Sick “boil right thigh” contracted in line of duty, in quarters from Dec. 22, to 26, 90; killed by “gunshot wound of head” during engagement with Big Foot Band, hostile Sioux Indians at Wounded Knee Post Office, S. D., Dec. 29, 1890; due soldier for clothing not drawn in kind at date of death $42.89; inventory of effects etc. have not yet been performed. § Private Regan, Michael: Enlisted on Sep. 18, 90 at Brooklyn, New York by Capt. Boyle. Due U.S. Laundry Jefferson Barracks, Missouri, 47¢; recruit from Depot; assigned to troop to date Nov. 28, 90; joined troop Dec. 6, 90; killed by “gunshot wound of head” during engagement with Big Foot Band, hostile Sioux Indians at Wounded Knee Post Office, S. D., Dec. 29, 90; due U.S. for clothing overdrawn at date of death $37.26; inventory of effects etc. have not yet been performed. § Private Granberg, Herman: Enlisted on Mar. 24, 88 at New York, New York, by Lieut. Wheeler. On special duty at Post Garden from Oct 28, 90, Ft. Riley, Kan., relieved from aforesaid duty Nov. 9, 90; died Dec. 30, 90 from “gunshot wound of back” received during engagement with Big Foot Band, hostile Sioux Indians at Wounded Knee Post Office, S. D., Dec. 29, 90; due soldier for clothing not drawn in kind at date of death $24.50; inventory of effects etc. have not yet been performed. Private Kelley, John W: Enlisted on Sep. 23, 90 at Cleveland, Ohio, by Capt. Carpenter. Due U.S. Laundry Jefferson Barracks., Mo., 54¢; transferred from Troop B to A, 7th Cavalry Dec. 13, 90; joined Troop Dec. 13, 90; deserted at Pine Ridge Agency, S. D., Dec. 19, 90; due U.S. for clothing overdrawn at date of desertion $49.48; due U.S. C & E $12.95; due U.S. for Ordnance and Ordnance Stores $14.68. The Recapitulation and Record of Events Page of A Troop, 7th Cavalry Regiment’s Muster Roll of December, 1891. The troop performed the usual garrison duties at Ft. Riley, Kan., from Nov. 1 to 23, 90. Left Ft. Riley, Kan., Nov. 24th en route to Rushville, Neb., by rail, arriving at Rushville Nov. 26, 90, distance traveled by rail 591 miles. Left Rushville same day and marched to Pine Ridge Agency, S. D. on arriving at the latter place Nov. 27, 90, distance 26 miles. The troop remained in Camp at Pine Ridge Agency, S. D. from Nov. 27 to Dec. 26, 90. Left Pine Ridge Agency Dec. 27th in pursuit of Big Foot Band of hostiles Sioux Indians and marched to Wounded Knee Post Office, S. D., distance 18 miles. Dec. 28. Marched 9 miles towards Porcupine Creek, S. D. and participated in the arrest of Big Foot Band, returned to Camp at Wounded Knee P. O. same day. Dec. 29. Participated in the disarming of Big Foot Band with the following results: Killed Sergt. Arthur C. Dyer, Sadd. Henry Frey, Pvts George P. Johnson, James Logan and Michael Regan. Private Herman Granberg received wounds from which he died the following day, Dec. 30, 90. One private horse the property of Capt. M. Moylan and 2 public horses killed. Wounded: 1st Lieut. Ernest A. Garlington, Sergt. Alwin H. Haselwood, Privates Harry D. Duncan, Daniel McMahon, and Adam Neder. Four public horses wounded. Returned to Pine Ridge Agency, S. D. same day distance 18 miles. Dec. 30. Marched 6 miles down White Clay Creek, S. D. in pursuit of hostile Sioux Indians and engaged in battle with them the same day, with no loss, killed nor wounded, Returned to Camp at Pine Ridge Agency, S. D. same afternoon. Dec. 31. Remained in Camp at Pine Ridge Agency, S. D.
Total distance traveled by rail 591 miles. Total distance marched 92 miles. 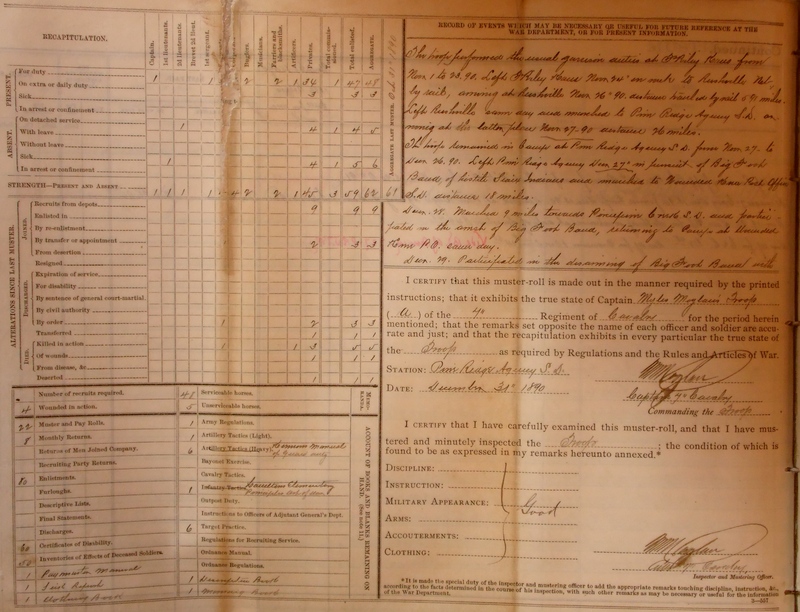 Source: Adjutant General’s Officer, “7th Cavalry, Troop A, Jan. 1885 – Dec. 1897,” Muster Rolls of Regular Army Organizations, 1784 – Oct. 31, 1912, Record Group 94, (Washington: National Archives Record Administration). 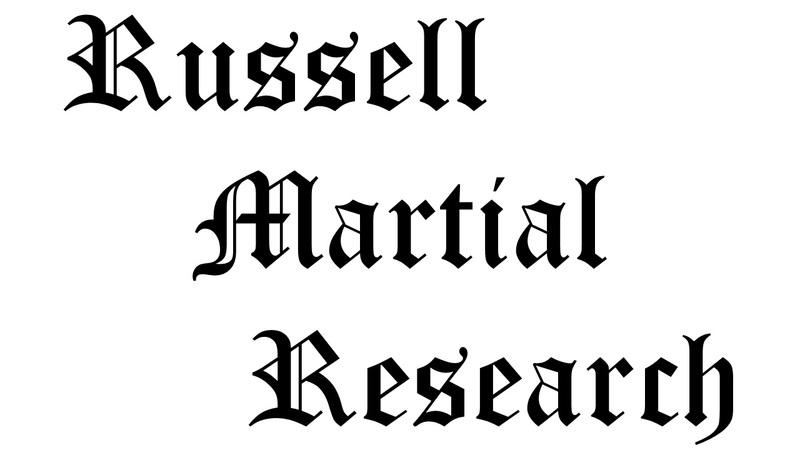 Citation for this article: Samuel L. Russell, “A Troop, 7th Cavalry Regiment Muster Roll,” Army at Wounded Knee (Sumter, SC: Russell Martial Research, 2013-2015, http://wp.me/p3NoJy-7X), posted 1 Sep 2013, accessed date __________. This entry was posted in Muster Rolls, Official Reports and tagged 7th Cavalry, 7th Cavalry Regiment (United States), Cavalry, Lakota, Miniconjou, Myles Moylan, Oglala Lakota, Pine Ridge Agency, Pine Ridge Indian Reservation, Sioux, Wounded Knee, Wounded Knee Creek, Wounded Knee Massacre. Bookmark the permalink. As a boy in the 50 in Lawrence Kan. A man I belive his name was Reed had a lot of Indian shirts and arifacts. He claimed to have been a soldier. My English was not to god, being a refugee German Ukranian. All was solde at auction in California.